5 Steps for Trimming a Cow - Diamond Hoof Care Ltd.
Are you struggling with hoof trimming? This free infographic shows you how to trim a cow in 5 easy steps. Our mission is to make hoof trimming easier and more enjoyable for you and others. Can we help you? This single-page infographic explains how to trim a cow in 5 steps. These easy steps are laid out in clear, easy-to-follow graphics. And as an added bonus, we’ve added tips to each step to explain correct hoof trimming. To explain hoof trimming, we use the proven Dutch method which was developed in 1973. The first steps explain functional trimming, while the last two steps explain curative trimming. 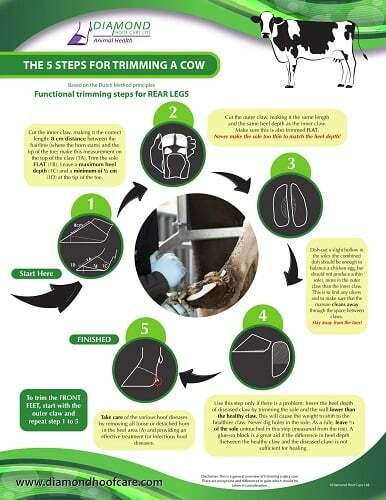 This infographic is a great tool to print off and hang beside your hoof trimming chute. The Dutch trimming method is explained using clear and easy-to-read graphics. Koos’ career as a full-time hoof trimmer was from 1994 until 2010. He now runs Diamond Hoof Care and has made it his mission to help thousands of dairy herdsmen understand, overcome and prevent lameness. We love to help make hoof trimming easier for you. This infographic is a PDF download. By clicking “Download infographic” you agree that we may send you some follow-up emails. You can unsubscribe at any time. Diamond Hoof Care Ltd. is specialized in hoof care for cattle. Together with Intracare BV from the Netherlands, we keep abreast of trends in the animal health world. Our specific focus is on dairy hoof care and digital dermatitis control.